Grove Lodge in Marshchapel, near Louth sleeps 4 people. 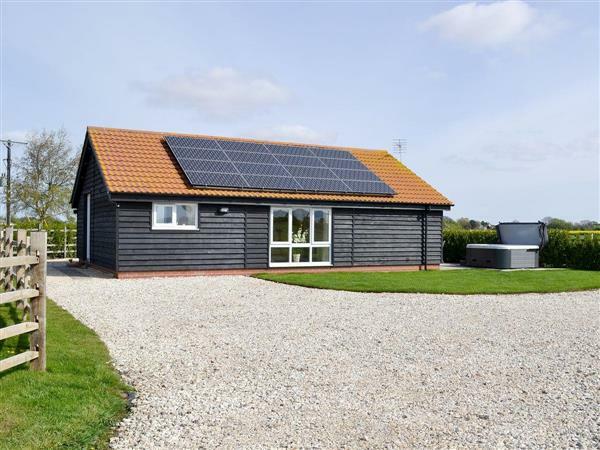 Grove Lodge near Louth has open views across the fields towards the Lincolnshire Wolds, which you can take whilst relaxing in the hot tub with a glass of prosecco, after a busy day exploring the area. Grove Lodge is a detached lodge, in the grounds of the owner’s home, and is nestled close to the seaside, where you can enjoy an evening stroll along the sand dunes and the sandy beach with your dogs. Alternatively, guests can visit the traditional seaside resorts of Mablethorpe and Cleethorpes, which are situated nearby. Donna Nook, with its seal breeding grounds, is just a short drive away, where you can walk within a few yards of the seals. Visit the Georgian market town of Louth which still enjoys 3 markets a week and has many good places to enjoy an evening meal or a light lunch. There are very good walks and cycle routes straight from the door, and with Tetney Golf Course and Kenwick Park Golf Club, both within a 15 minutes’ drive away, this property is the perfect retreat for outdoor fanatics. The beach is 4 miles. With the shop, pub and restaurant 1 mile from Grove Lodge near Louth. Grove Lodge near Louth is all on the ground floor. Living room: With 32 Freeview TV, DVD player, CD player and wooden floor. Bedroom 1: With king-size bed, Freeview TV and en-suite with shower over bath, and toilet. Electric central heating, electricity, bed linen, towels and Wi-Fi included. Travel cot and highchair available on request. Welcome pack. Enclosed lawned courtyard with sitting-out area, garden furniture and barbecue. Hot tub for 4 (private). Bike store. Private parking for 2 cars. No smoking. Holidays at Grove Lodge run from Friday to Friday. Pets allowed at Grove Lodge. Grove Lodge is in Lincolnshire; should you be on the lookout for a special offer, you can find all the special offers in Lincolnshire. It's always worth checking to see what is on offer at the moment. Do you want to holiday near Grove Lodge (UKC1079), you can see other cottages within 25 miles of Grove Lodge; have a look to find your perfect holiday location.